"The world is nothing without sports." Those words accompanied Jack Woodland's photograph in the 1944 Fostoria High School yearbook. 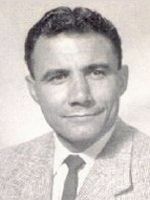 One of the great fullbacks and linebackers of the 1940's for the Falcons, Woodland earned awards each of his four years with the team, gaining 1,752 yards rushing for his career, climaxing with 694 as a senior. He gained All-Ohio honors for three years, more often than any other BG player of his day. He also wrestled as a heavyweight for the university for two years. He also won the school wrestling and boxing championships during his senior year at Fostoria. A Navy veteran, Woodland served in World War II before arriving at BG. He was drafted by the Cleveland Browns along with teammate Bob Schnelker in the 1950 NFL Draft. His professional career, however, was cut short by a leg injury. He returned to northwest Ohio, serving as an educator in Napoleon and Fremont. He passed away in Fostoria on December 23, 2005. He was inducted to the BG Athletic Hall of Fame in 1967.